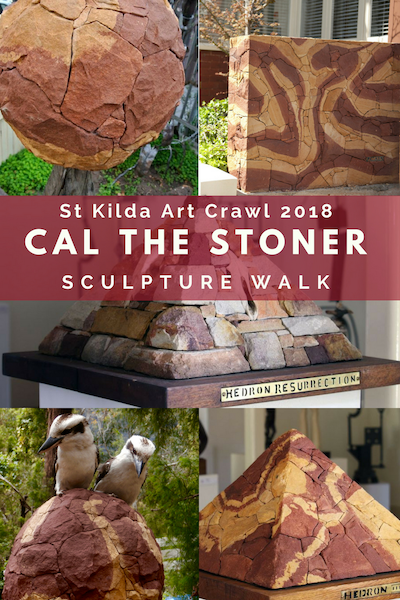 Cal the Stoner is a sculptor, dry stone artisan and short story writer based in St Kilda, Victoria. My practice commenced with an initial idea that centred on locating specific veins of Australian sandstone featuring unique colouration. Via a process of contemplation I create sculptural works featuring texture, colours and image, from individual stones. Throughout my youth I worked and travelled extensively around Australia, finally settling in my current home of St Kilda. My works have an essential connection to both country and city. I utilise the techniques and knowledge gained in over 25 years as a professional stone mason to bring my conceptual forms to life. My pieces have a range of influences. Initially drawing on my experiences and interactions and extending to my family’s strong historical connection throughout Victoria. For example Planet Zoe, is set on the baptismal font from my mother’s local church in Bayswater. The most prevalent influence comes from my lifelong connection with heavy rock music. Since completing the first sculpture, Stone River #4 (2003), I have been exhibiting continuously around Melbourne. My practise now includes; Stone River Series, Planet’s of Galaxy Z, Geometric series and The Hedron’s. Since 2017 I have been sculpting at the Theatre Research Institute in Williamstown. I continue to undertake commissioned architectural features for private residences and businesses, where they draw upon the artistry displayed in my sculptural work. With my recent works I am looking to expand internationally. 888 (Geometric series) and Planet Zep of Galaxy Z, both due for completion in 2018, are two feature examples of the progression of my professional practise. They combine intricate designs integrating mystique and involve collaborations with local makers to bring the final concept into being. Cal is a member of the National Association of Visual Artists (NAVA) and the Association of Sculptors Victoria (ASV). My practice centres on locating specific veins of Australian sandstone featuring unique colouration. Via a process of contemplation I create sculptural works featuring texture, colours and image, from individual stones. Throughout my youth I worked and travelled extensively around Australia, finally settling in my home, St Kilda. My works have an essential connection to both country and city. I utilise techniques and knowledge gained in over 25 years as a professional stone mason to bring my conceptual forms to life. My pieces have a range of influences. Drawing on my experiences and interactions and extending to my family’s strong historical connection throughout Victoria. i.e. Planet Zoe, is set on the baptismal font from my mother’s local church in Bayswater. I continue to undertake commissioned stone masonry work, where it draws upon the artistry displayed in my sculptural work. With my recent works I am looking to expand internationally. 888 (Geometric) and Planet Zep of Galaxy Z, due for completion in 2018, example the progression in my professional practise. Increasingly intricate designs, integrating mystique and involving collaborations to bring the final concept into being. The relationships Cal continues to build throughout his lifetime, have brought forward many collaborators who have influenced Cal’s practise development. Cal collaborates with Ben Feyen (brass), Josh Jones (metal/welder), Geoffrey Williams (creative director), Sian Bundock (visual artist/maker), Jimmy Foster (app/website developer) and Michelle Harrington (artist/writer). Cal has exhibited annually at The Lost Trades Fair Kyneton.